Brand Badger: How Does Your Brand Come Across? I snapped this picture on a sidewalk in Cardiff, Wales. 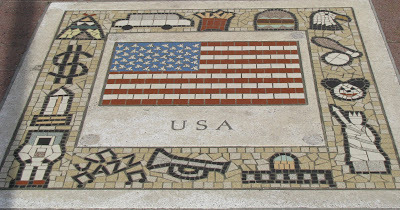 Along my path were tile mosaics of various countries, with illustrations of symbols commonly identified with that country. 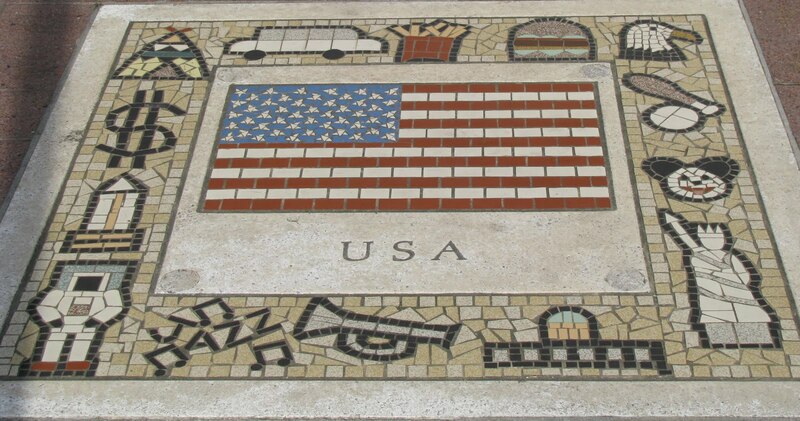 It was peculiar to me what the U.S. had on its mosaic. On one hand, there was the Statue of Liberty and a bald eagle-- symbols of freedom that all Americans can be proud of. More conspicuously to me, however, were the images of a hamburger, fries, and a dollar sign. Personally, I do not want to be known for symbols so easily connected to obesity (fast food) and greed (money). Yet, that is how the U.S.'s brand came across (at least to the Welsh). The takeaway from this, at least for me, is to have a greater awareness of how my brand comes across. That way I can focus more on projecting the image that I want to be associated with, instead of something carrying a negative connotation. Good point. When I lived in Korea most people thought hamburgers were our main food source. They eat rice and kim chi everyday and we eat hamburgers kind of thing. I would love to get rid of that opinion of America. Great post. Is that Mickey Mouse on there?